Creating a home with the person that you love more than anything, what a gift that is to be treasured. Sharing your day and your life with a person that loves you and cares about your well being, now that’s heaven. Knowing deep within that they will be there to support you and that they believe in your magnificence, even on days when you feel ‘ordinary’. Seeing their face, hearing the timbre of their voice, feeling their exquisite touch, skin upon skin there is nothing that can be substituted for that. It’s truly magical. My all time favorite movie is “Pride & Prejudice” (the Keira Knightley version) After all the trials and tribulations that Elizabeth Bennett & Mr. Darcy have been through, the most exquisite moment to me in the movie is when he finally has the courage and bravery to declare to her “I never wish to be parted from you from this day on.” Yes!!!!!! A BIG YES!!!!! Because that’s it!! That is the feeling. When you love someone with all your heart you want to be with them. I am certain that we are whole beings on our own however our heart knows something is missing when we are not physically present with our beloved. We feel it at every moment. A day feels like an eternity. We have all heard about couples who have such GREAT LOVE for each other that they are together and intertwined in their daily lives and when one of them passes away, so does the other within a very brief amount of time. I believe this is because they don’t wish to live without the other by their side. They deeply KNOW what it’s like to feel and have such GREAT LOVE for each other. Here is another ‘sign’ that came to me from out of the blue while driving this week …….. 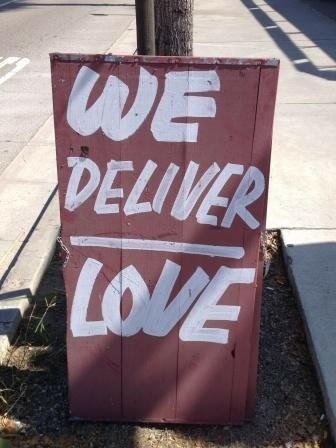 Imagine being given the opportunity to ‘deliver love’ each day to someone you care about with all your heart. What an extraordinary life that is! This entry was tagged Elizabeth Bennett, Great Love, Keira Knightley, Mr. Darcy, Pride and Prejudice, Rev Bob Luckin. Bookmark the permalink.